The appearance of asparagus sprouts signals spring. For a few weeks, these stalks grow fast; however, if you know how to grow asparagus, then you know this crop requires of tender loving care, and above all else, patience. Unlike other vegetables that need to be planted new each season, asparagus is a perennial bulb. It continues to sprout year after year. The benefit of being a perennial is that it saves money (you don’t have to buy new seedlings every year) and you can pick harvests over several springs. The downside is that asparagus is finicky. It must have exact growing conditions, you must follow a particular pattern of care, and you have to wait a few years before reaping the rewards. Still interested? Here are a few growing tips from the experts at The Old Farmer’s Almanac and Sunset Magazine. Asparagus simply cannot stand weeds or grass. Before you even think about planting the veggie, rid the plot of any weeds or grasses. Give the soil a boost with compost and an organic fertilizer. If you can find it, add a little rock phosphate powder to encourage strong roots. Dig a trench at least 6 inches wide and 6 to 12 inches deep. Pile up little mounds of dirt approximately 18 inches apart from each other. Place the asparagus crown on top of the mound and spread the roots down the sides of the mound. Cover both crown and roots with a couple of inches of soil, but not enough to fill up the trench. Water. Keep the soil well watered. As the stem grows, fill in the trench with quality soil, keeping a few inches of stem above ground. Eventually the trench should be filled. As the weather turns colder and the fronds turn yellow, trim them down to approximately an inch above the soil’s surface. During the second spring, go ahead and clip a few spears to taste test, but leave the majority of the new growth to mature like you did the previous year. By year three, the asparagus plants should be established and you can harvest as much as you like during that brief two to three weeks in spring. Wait for the stalks to be thicker than a pencil. Once the tips start spreading out, stop harvesting and allow the plants proceed to the frond stage. Asparagus can be cooked in a variety of ways, including oven roasted. Sprinkle with a little olive oil, salt and pepper, place them in an oven-safe pan like this one from Pyrex Bakeware, and cook at a high temp for approximately 15-20 minutes. 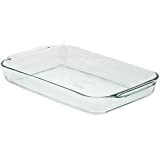 The glass pan is also safe for the microwave, freezer and dishwasher. If you want to chop asparagus for soups or whip up a tasty sauce to pour over the spears, you don’t have to pull out a big blender. The Mini-Prep’s 3-cup plastic bowl handles dinner-sized portions.